Welcome to the Shared Course Initiative (SCI) online handbook. If you are considering enrolling in an SCI class, you can use this page to get a better sense of the classroom experience. If you are currently enrolled, you will find information that will be useful to you as you the semester proceeds. If you are an instructor, you will be able to find information on SCI policies and semester calendars. The SCI classroom is a single class shared by more than one site. Students and instructors have the same responsibilities toward one another as any face-to-face language class for university credit. This means that students are expected to participate fully, to arrive on time, and to come to class according to the attendance policy laid out in the syllabus. By the same token, instructors will consider the remote students just as they would students in the classroom with them, because it is, in fact, one class at more than one site. Nonetheless, there are some differences in policies and procedures between Columbia, Cornell, and Yale. One notable area of difference is the academic calendar. 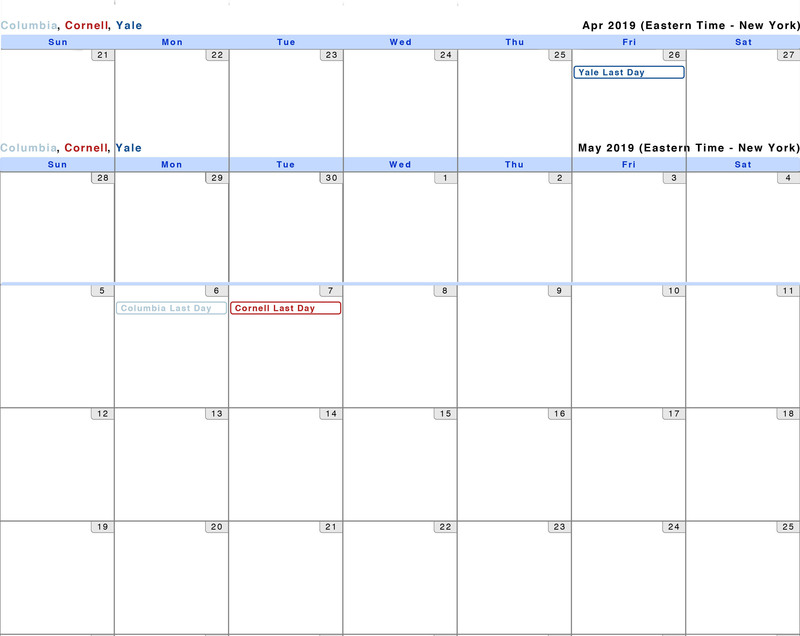 The academic calendar of the sending institution sets the calendar for the entire class, and remote students are expected to do their best to accommodate these differences in schedules. This can include attending class during breaks, watching a recorded version of a class, or doing extra work independently when the sending institution is on break. For more information on calendars, see section three. Since cross-institution interaction takes place via the camera and the screen, learning how to control the cameras on both ends will greatly enhance the class experience. Both students and instructors are active participants in creating the space of instruction, so feel free to experiment, get feedback, and work together to find what works best for you. During the first week, all students will get a brief tutorial on the equipment from Chris at Columbia, Sam at Cornell, and Kristi at Yale. If you aren’t sure how to operate the videoconferencing equipment, please ask! Students and instructors should speak about the academic calendars at the beginning of the semester, and develop a semester plan that works well for everyone. There will be several times throughout the semester when the calendars of the three universities will vary. The sending institution sets the schedule for the class, and the remote students are expected to make reasonable efforts to participate as fully as possible in this schedule. Click on the calendar to view it at full width. Course sites such as Canvas and Blackboard are essential tools in distance classes. Speak with your instructor about their preferred use of the course site. Please note that all Cornell and Yale students enrolled in Columbia classes will need to receive unis to access Columbia’s Courseworks. We will reach out to you at the beginning of the semester to get the necessary information. There are multiple ways to submit homework. Some instructors ask their students to use the built-in homework function of the course site, while others will accept handwritten work, sent via a scanned image. Speak with your instructor about their preferred method. Throughout the semester, the SCI project team will be studying students’ and teachers’ experience, trying to understand and improve language teaching and learning at our three schools and beyond. Your optional participation in a few short surveys and conversations takes little time and is incredibly helpful; we’ll visit your class to speak more about this in the first few weeks of the semester. 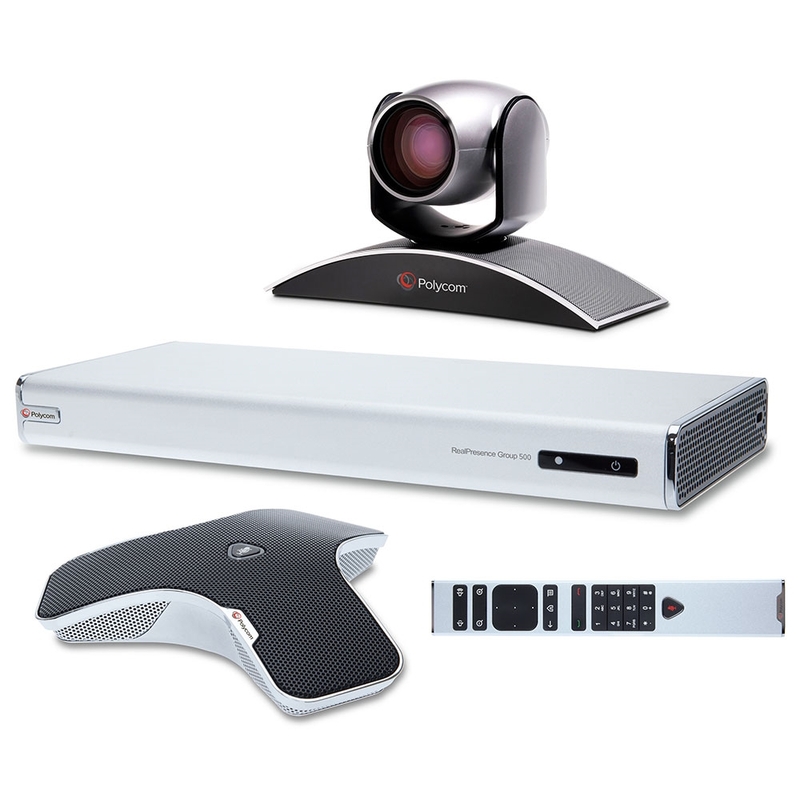 The Shared Course Initiative uses specially-designed videoconferencing equipment to connect each classroom. 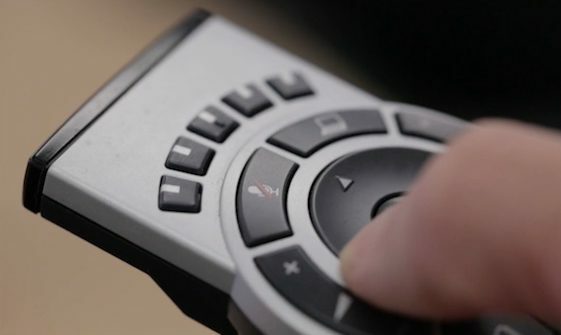 The name of the videoconferencing computer is a “codec.” Each codec has an associated remote control that operates it. You should know how to use this equipment, especially if your instructor is not on site. You are responsible for actively shaping the classroom view so that you can have the optimal experience. If you have any questions about how the classroom should function, please contact your on-site technology assistant. Reach out for help when you need it. Your instructor will be your main point of contact throughout the course, and will be available weekly for virtual office hours. However, you also have other resources on hand to help you out if you’re experiencing any problems participating in your shared course. At Columbia, you can contact Chris Kaiser (ck2831@columbia.edu) for issues related to technology and classroom coordination. At Cornell, you can contact Sam Lupowitz (sbl83@cornell.edu) for issues related to technology and classroom coordination. At Yale, you can contact Maria Ideliu (maria.ideliu@yale.edu) for issues related to technology and Minjin Hashbat (minjin.hashbat@yale.edu) for issues related to classroom coordination. If you’re a new instructor in the Shared Course Initiative, there are some basic expectations we share across our three campuses, which were laid out in our original Memorandum of Understanding, the institutional framework that guides the Shared Course Initiative. When a new language is added to the SCI, there is a shared expectation that two years of continuous instruction will be offered for students, so that their study is not interrupted. If you start by offering a year of Elementary/Beginner level, it is expected that a second year will be offered. Columbia also requires the date of birth of any SCI instructor from Cornell or Yale. There are several curricular requirements specific to each institution, specifically regarding required hours of instruction. For instance, for the first two years of language instruction, Yale requires their students receive 5 contact hours (or 5 x 50 minutes, for 250 total minutes) per week. However, Columbia and Cornell only require four hours of instruction per week for their students. So if you are a Columbia or Cornell instructor sending instruction to a Yale student, there are several strategies for providing this extra hour of instruction. Student privacy is of utmost importance to us. Therefore, each institution requires that no final grades should ever be submitted over email. All grades should be submitted over the phone. At the end of each semester, you can either verbally communicate your remote students’ final grades to your local campus administrator, or you can call the remote administrator directly. Early in the semester, you should collect your remote students’ institutional email. If you are able to add the student to your course management system (i.e. Canvas, Sakai, Course Pages), you should add them and manage your outgoing messages from your course site. If you have any trouble collecting your remote students’ addresses, please notify your campus administrator and they’ll provide you with the correct contact info. Conversely, your remote students are expected to communicate with you through your institutional email address. Please Note: as with all your students, please refrain from using their personal contact info (e.g. Gmail, Yahoo, AOL, etc), even if they request you to do so. At Columbia: Your remote students will be assigned Columbia unis within the first weeks of class, and will be added to your course site automatically. Each SCI instructor is expected to teach from the remote campus once a semester. Teaching from the remote campus gives you an opportunity to build rapport with the remote students, and helps your local students empathize with the ‘normal’ experience of the remote students. Campus visits should also be considered an opportunity to do outreach at the remote campus. If you’d like to schedule a talk or cultural event on the remote campus during your campus visit, reach out to your campus administrator well ahead of your trip. For instance: Mona Momescu recently held a Romanian film screening event and talk on the Cornell campus, to which she invited students and faculty from several relevant departments and student organizations. When making plans for traveling to Columbia, Cornell, or Yale, please consult your campus administrator for both reimbursement guidelines as well as travel recommendations.